In the 1930s it wasn’t just the Poverty Row studios that gave us B-picture horror clunkers. Columbia released this fugazi of a gem (aka He Lived to Kill) starring Bela Lugosi and directed by Ben Stoloff before they achieved major status. It’s amusingly bad with a plot resolution straight out of the Scooby-Doo play-book, but rattles along at a good pace as long as you don’t step on the evident cracks. 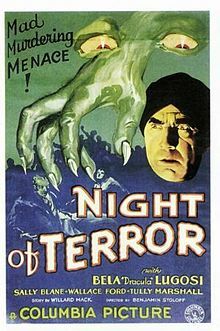 Night of Terror hinges rustily on the combined tropes of ‘mad-man on the loose’ with a Cat and the Canary-style war of attrition as relatives feuding over a will are bumped off one by one – and mixes them with the binding agent of a (very) little science for good measure. A maniac serial-killer is at large in America, leaving newspaper-clippings pinned to his victims’ bodies. For some reason, he focuses his spree on the Rinehart Mansion where wealthy head of the family Richard Rinehart (Tully Marshall) watches over his nephew Dr Arthur Hornsby (George Meeker) as he perfects a laboratory potion that will enable a human to live for extended periods of time without oxygen. He will later prove this by allowing himself to be buried alive. 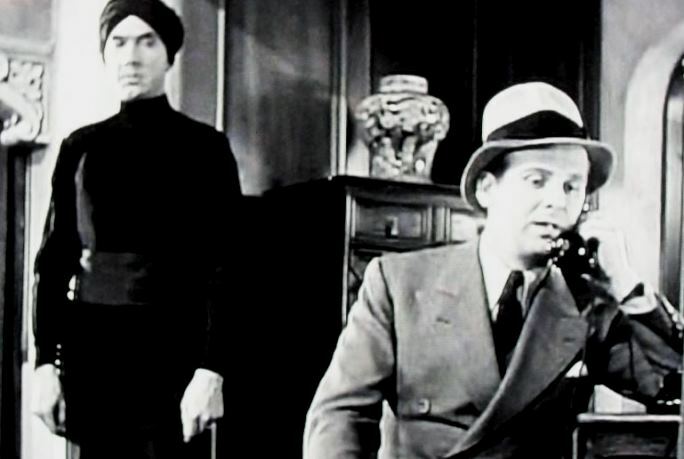 Marshall already had form in this horror sub-genre, having played the lawyer in 1927’s The Cat and the Canary. Meeker was also well established at playing gloomy, unlucky in love wimps. Here he demonstrates this by being so wrapped up in his test-tubes that he isn’t aware his fiancé Mary (Sally Blane) is none-too-convincingly fending off the attentions of wise-guy newshound Tom Hartley, played by Wallace Ford. She protests too much that she is not interested in the crude scoop-hunter, while he reveals they’ve just been to the movies together. Later on, she doesn’t exactly tear herself away from him when he grabs her for an impulsive snog either. Ford’s real-life adventures were worthy of a feature himself. Born Samuel Jones Grundy (or Grundy Jones), he was placed into a Dr Barnardo’s orphanage in Bolton, Lancashire at the age of three. Four years later, he was packed off to Canada as part of a government drive to populate Empire farming families in the territory with home-grown adoptees. Sadly, he was one of the 100,000-plus kids unlucky enough to be subjected to conditions of Dickensian cruelty. After a horrendous period of fleeing and forced resettlement totalling 17 times, he escaped the cycle to find a better home and an introduction to showbiz on the road with the vaudeville troupe the Winnipeg Kiddies. At the age of 16, Samuel and a pal hitched their way aboard trains to make their fortune in America. Their grand plans were marred by tragedy however when his friend was killed by a train, prompting Samuel to take his name of Wallace Ford, partly as a tribute and also to erase his awful past. Aside from his good-hearted Phroso in Freaks (1932), Ford went on to a long career including two more of Universal’s re-activated franchise sequels The Mummy’s Hand and The Mummy’s Tomb. He also enjoyed the happy ending of a reunion with his long-lost mother in England after a life-time of believing he was an orphan. Back in the lab, the mood emanating from Arthur is less rosy. It’s oddly fitting that he’s preparing to be interred since Meeker seems to recite his lines as a dreary, monotonous eulogy. Surely he should be excited on the verge of a new scientific break-through? With Lionel Atwill unavailable for a mad show-boating aria, we must look elsewhere for energy in this house. Fortunately, for those who like their dialogue delivered with impact, enter Bela Lugosi, the master of delivering ‘portentous force’ whether you like it or not. He is Degar the butler, although you’d be forgiven for guessing him as an Indian Swami guest - or Sultan as the detective later labels him - with his tunic, turban and exotic hooped ear-ring. Lugosi was mired in such personal debt when he made Night of Terror that to make extra money he pulled double-duty on this at night whilst filming as General Petronovich in the W.C. Fields comedy International House by day. This movie certainly does him no artistic favours; he simply veers between the modes of either oppressive hypnotic stare or a pained grimace of wholly understandable private mournfulness. Degar is something of a double-act partnered with Sika, (Mary Frey), the darkly Latin-American maid who is given to Cassandra-like premonitions of doom. “Death is very close…” Together they pronounce continual warnings to the family in no uncertain terms. Degar dismisses newspaper contents as: “Nothing but…murrr-der!” amongst other creepy pearls of glowering wisdom. Homicide is indeed very close. Richard Rinehart is murdered off-screen, emitting the discomforting groan of someone passing a troublesome stool more than passing away. We then begin to assemble the suspects in the drawing room, as it were. Firstly, there is the elusive, grotesquely ugly Maniac himself - snaggle-toothed and broad-brimmed of hat. We can rule out Tom and Mary as they have the alibi of a chauffeur- driven return to the house whilst a Lovers’ Lane couple were being murdered. Equally, we can cancel out the chauffeur himself, Martin, (Oscar Smith), a feat the actor may wish to have had extended to the entire film in a sense as, despite a sizeable part, he is clearly only there to inherit the ‘lawdy lawd-able’ dumb black stereotype mantle from Willie Best in 1932’s The Monster Walks. (See earlier review). Smith is required to play the wide-eyed coward and with a speech-pattern straight off the southern plantation. Ironically, in spite of such relegation, he displays the most common sense of any of the characters. Upon discovering that in Rinehart’s will, each surviving heir inherits the shares of the others, he’d rather be disinherited from his $100 a week inheritance that is paid “As long as I live”. It’s not only Martin that is the victim of racism. The enigmatic Degar and Sika are twice referred to as “heathens” for the presumed impertinence of being foreign. Could they be guilty, especially as Lugosi pauses to ponder the possibilities in the will for their own benefit? Our suspicions are meant to fall on the vulture pair of relatives who’ve suddenly arrived to claim their shares. John and Sarah Rinehart (Bryant Washburn and Gertrude Michael) resent the equal parity given to the servants in the will. This now becomes a fun zero-sum game as one by one the bodies pile up, meaning Tom is repeatedly on the ‘phone calling his updated copy through to the newspaper’s night desk every time. As the cast are bumped off, more human firewood turns up for the bonfire. The cops arrive, led by Matt McHugh, one of those Hollywood detectives who are amusingly interchangeable with unsavoury mobsters. (It takes one to catch one?). Also now on hand are a couple of professorial beards from the committee to witness Arthur’s scientific experiment. Yes, finally he’s ready to prove his amazing life-serum’s properties by having himself buried and rejuvenated by it - with all the enthusiasm of a man reading out a Nigerian spam email. Arthur entrusts Degar with the only key to the drug cabinet, impressing on him that they wait eight hours till 5 a.m. before administering it. This begs the question ‘How will they give him the serum in his grave without letting in oxygen that negates the whole point of the experiment?’ Well, it’s all mind over matter really. Once you apply a mind to this script, it ceases to matter. John Rinehart is not waiting around. He appears to incriminate himself by pilfering the key from the dozing Degar, but is fatally stabbed by a shadowy knife-wielding figure. Martin once more shows the smart instinct for self-preservation everyone else lacks: “I don’t care where you put me as long as you put me next to a door.” I know the feeling. The plot of Night of Terror shrinks like a slug under the salt of close examination but you have to admit it never stops moving. The occupants decide to hold a séance led by Sika, much to the objections of Degar. Sadly, she checks out with a scream whilst trying to contact her old master on the astral plane. The group opts to revive Arthur early. Listen out for the esteemed professor who tells the detective that the serum cabinet is “In the lavatory”. The pace now moves into high gear. Degar is forced to open the cabinet, yet sneakily stalls for time by drugging the supervising cop with “An oriental cigarette”- high gear of a different sort. Lo and behold, we discover a secret tunnel from the grave used by Arthur, the real criminal, who employed the Maniac (apparently shot dead and never explained as a character) in his dastardly plan to liquidate all his rivals to the Rinehart fortune. His uncle Richard was also dispatched because he allegedly had rumbled that Arthur’s wonder-drug was bogus. It’s a refreshing change to see Lugosi in something of a rare heroic vein, holding the culprit who would have got away with it if not for those meddling er…kids. Speaking of rare, Night of Terror is extremely hard to find. I was lucky to trace a private owner's copy, which unfortunately cuts just before Edwin Maxwell as the Maniac actually rises from his dead place to threaten the audience with dire consequences: “...If you dare tell anyone how this picture ends”. He needn’t go to all that trouble. Anyone who recommends this to a friend at all will regret it – unless it’s for a so-bad-it’s good laugh.